Jalebi is a very popular Indian sweet and it makes special occasions more delectable. This festive dessert is loved by both kids and adults equally because of its taste and texture. You can make jalebis in different ways. Some recipe needs a day for fermentation while some recipe calls for yeast or eno salt. Fermentation makes the batter slightly sour. 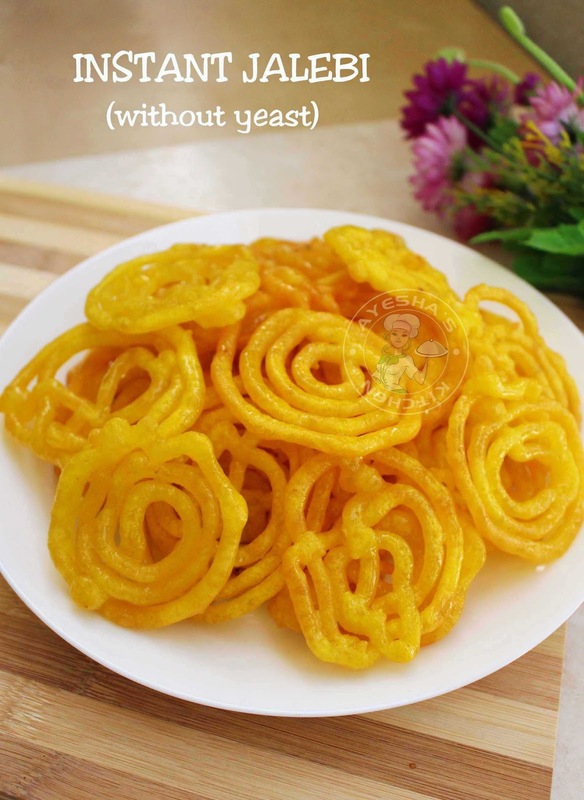 Here am sharing the recipe for Instant jalebi without yeast. For the sour taste, i added curd. So it is very easy to whip up this dessert.. I took only 15 minutes to make this crispy juicy piping hot jalebis. I truely enjoyed making this melt in mouth Indian sweet at home. Here is the video showing how to make Instant jalebi at home easily. In a mixing bowl, Sieve together All purpose flour, cornflour and baking powder. Mix well. Combine curd and food color in another bowl. Add this curd mixture to the flour mixture and mix . Then add water little by little and make a smooth batter without any lumps. Do not pour the whole water at a time. The jalebi batter must not be too thick nor too thin. So add water accordingly. Pour the prepared jalebi batter into a squeeze bottle. You can also pipe the jalebis using a piping bag. Here i used a sauce bottle or squeeze bottle for making jalebi. Set aside. Now prepare the sugar syrup. For that, heat sugar and water in a pan and stir so that sugar dissolves. Once the syrup starts to boil, simmer it for 5 minutes. 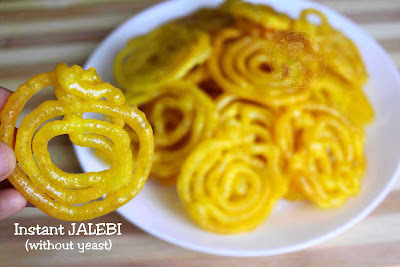 For jalebi, we need half string consistency. That means, the consistency of sugar syrup in between sticky and one string. So switch off the flame before one string consistency. Set aside and then add lemon juice and crushed cardamom to it. Mix well. Heat a pan with oil for deep frying over a medium low flame. Once hot, add a teaspoon of ghee (this is optional only). You can squeeze a drop of this batter to the hot oil to check the right temperature. Now start making swirls using squeeze bottle. You can check my detailed VIDEO given above for more details. Fry the jalebis over medium flame. Flip the jalebi when one side is done. Do not over fry. When done, transfer the jalebis to a slotted spatula for draining the excess oil and immediately dip the hot jalebis in sugar syrup for just 30 seconds. Transfer it to a plate. Repeat the same with remaining batter. So the piping hot crispy juicy jalebis are ready to serve. You can serve this warm or chilled. You can also keep the leftover jalebis for later use in refrigerator. 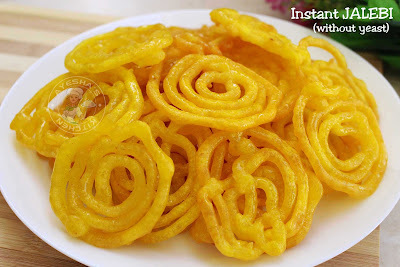 Do not forget to watch the video showing how to make instant jalebi. And please SUBSCRIBE to my channel too my dear friends.